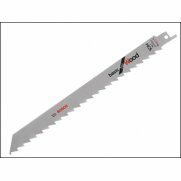 The Bosch S1531L Sabre Saw Blade is suitable for cutting wood. Specifications : Tooth design : Side Set, Ground.Material : HCS.Dimensions (LxWxT) : 240 x 19 x 1.5 mm.Tooth spacing / TPI : 5 / 5 mm.Areas of application : Coarse wood free of nails (< 190mm), pruning green wood (dia. < 190mm), firewood (dia. 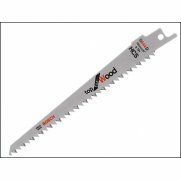 < 190mm).Pack of 5 blades.